Image Size: 32.25 x 21 in. Paper Size: 38.5 x 23.25 in. 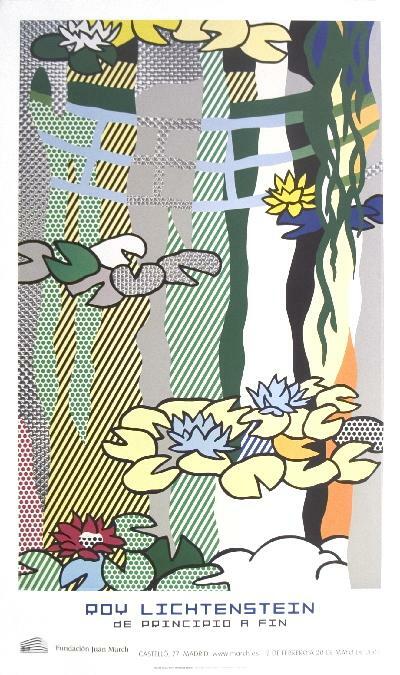 Dynamic Lichtenstein Water Lilies with Japanese Bridge Offset Lithograph. This is a wonderful exciting Offset Lithograph, Exhibition poster by Roy Lichtenstein for a show held in Madrid, Spain in 2007. First edition, not numbered, store flat. Limited Edition features sophisticated brilliant color tones in this print, excellent! Made of the very Finest Archival Museum quality Excellent NEW MINT CONDITION is Highly desirable for collectors. This item selling in Upscale Art Galleries and Museum galleries when and if it can be found. This item is subject to availability. This is perfect for any elegant home, office, restaurant or place of business. WE CARRY SEVERAL Linchtenstein Art works in our inventory. Click the button below to add the Dynamic Lichtenstein Water Lilies with Japanese Bridge to your wish list.